Zero compromise. 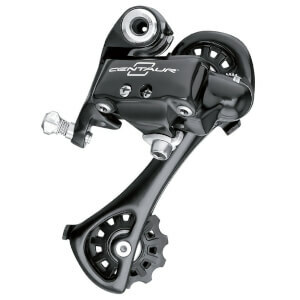 The Veloce rear derailleur raises the bar on 10-speed drivetrains, taking them to even higher levels of performance. The design of the parallelogram and oversized outer plate, already used for the 11-speed drivetrain, is "enveloping" and makes shifting incredibly fast, precise, and silent. 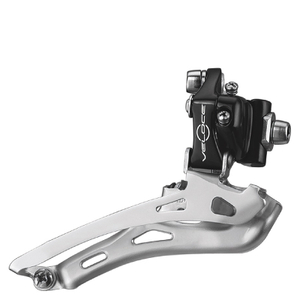 The design of the Veloce front derailleur cage enables perfect handling of both traditional and compact cranksets. Ultra-shift aluminum lower and upper body - Lower weight - friction reduction - longer component life. Aluminum paralellogram with exclusive ultra-shift geometry - Maximum shifting rigidity, fast actuation, precision, friction reduction. Special rubber pulleys - Reduced friction - less noise. Campy Veloce just gets better with age.